During the Games and especially in rush hour, the Greater Toronto and Hamilton Area will be busier than usual. Traffic measures such as temporary HOV lanes and parking restrictions may affect your regular routine. Be sure to plan ahead and take steps to avoid delays. On some routes, one lane will be converted to a temporary High Occupancy Vehicle (HOV) lane to help athletes and officials get to and from events and make it easier for Ontario families and carpoolers to get around. accredited Games vehicles used to transport athletes, media, technical officials etc. Temporary HOV lanes will operate from 5:00 a.m. to 11:00 p.m., and will be clearly marked with signs and pavement markings. This temporary HOV lane sign indicates that between 5 a.m. and 11 p.m. the lane may be used by vehicles with three or more occupants, public transit vehicles and vehicles with a Games permit. This temporary HOV lane sign indicates that between 5 a.m. and 11 p.m. the lane may be used by electric vehicles with green licence plates and licensed taxis. When marked with a dotted line as shown, vehicles may enter or exit the temporary HOVlanes. When marked with a dotted line and a solid line as shown, vehicles may exit the temporaryHOV lane, but not enter it. 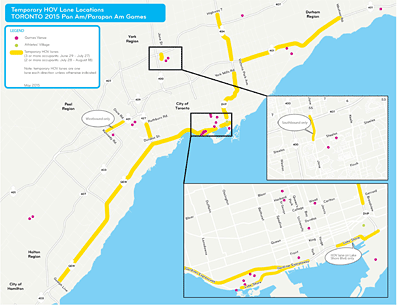 Check the map to find temporary HOV lane locations for the Pan Am/Parapan Am Games. This map shows the temporary HOV lane locations for the TORONTO 2015 Pan Am / Parapan Am Games. Temporary HOV lanes will be in place from June 29 to August 18. From June 29 to July 27, they will be open to vehicles with 3 or more occupants. From July 28 to August 18, they will be open to vehicles with 2 or more occupants. Gardiner Expressway and QEW, from Spadina Ave, to Guelph Line Rd. Highway 404, from Highway 7 to Highway 401. High 401 from Victoria Park Ave. to Westney Rd. Highway 427 from Dundas St. to Rathburn Rd. Don Valley Parkway from York Mills Rd. to Dundas Ave. Temporary traffic changes such as parking restrictions and turning bans will be in place near events. Read the local plans to see how you may be affected. The proposed plans may change, so be sure to check back frequently for the latest information to help you plan ahead. There may also be additional closures or restrictions in your area this summer due to construction or other special events, so be sure to plan ahead to avoid delays. If you’re going to the Games, use your ticket to get on public transit to and from the event for free. Many public transit providers will be adding or adjusting service during the Games. You should check with your local agency for an up-to-date transit schedule. If you carpool, you can use temporary HOV lanes to get around more efficiently and spend less time stuck in traffic. Get into the Games spirit and get active this summer! Avoid traffic by walking or cycling to and from work or for short distance trips. Watch an event with your friends after work to avoid the rush hour commute. With 51 sports at more than 30 venues across the Greater Toronto Hamilton Area, plus arts and cultural events happening throughout the summer, there is something for everyone. For the Games, re-time or reduce your commute by asking your employer about flex time or telework to avoid delays, reduce traffic and save time and money.